The Portuguese Minister of Science and Technology visits BSC with the Secretary of State R&D+i Carmen Vela. The Portuguese Minister of Science, Technology and Higher Education, Manuel Heitor, and the Spanish Secretary of State of Research, Development and Innovation, Carmen Vela, have visited today BSC to preside over the agreement to jointly collaborate towards the creation and set-up of the Minho Advanced Computing Center (MACC) and of the Air Centre Data Intelligence Network (AIR_DataNet). The agreement will be signed by BSC, the Foundation for Science and Technology of Portugal (FCT) and the University of Minho. 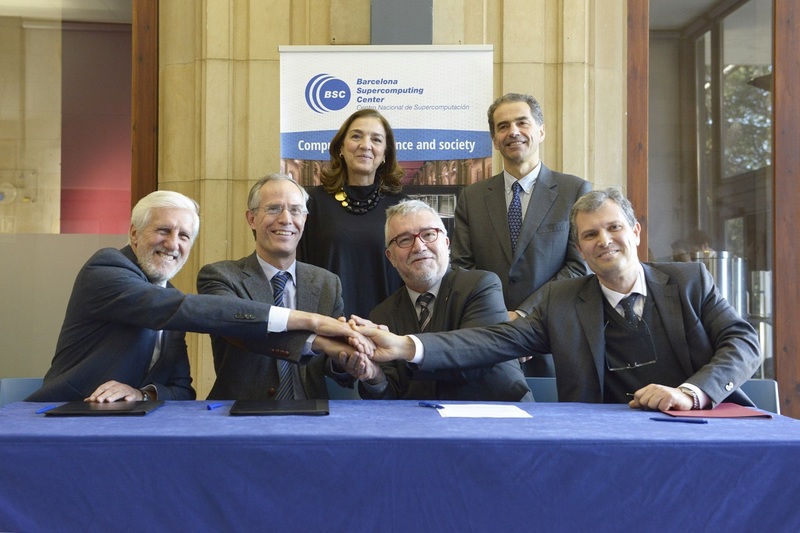 The new Advanced Computing Center will be located in the Portuguese city of Braga and will have the strategic help and experience of BSC, also contributing to the implementation of the AIR_DataNet project, as an integral part of the AIR Center (Atlantic International Research Center). This is a new international distributed research center promoted by Portugal with the participation of Spain and other countries in relation to five areas of activity: computing and data; space and applications; atmosphere and climate change; energy systems and ocean systems. BSC as coordinator of the Singular Scientific and Technical Infrastructure (ICTS) Spanish Supercomputing Network (RES in Spanish) will provide technical collaboration and training, technological capabilities, participation in AIR_DataNet and development of joint projects. The agreement is the result of the bilateral cooperation that has been carried out since the XXIX Hispano-Lusa Summit a few months ago and of the international declaration EuroHPC- first signed by Germany, France, Spain, Italy, Luxembourg, the Netherlands and Portugal. This European initiative aims Europe to host in 2020 new generation supercomputers. That has been supported by the European Commission with the creation of the EuroHPC Joint Undertaking, announced yesterday in Brussels.